Rail oil spill: Keystone fight isn't futile. Railroad tanker cars sit outside of the Chevron refinery July 14, 2008, in Richmond, Calif.
Another day, another spill related to rail shipment of oil and propane gas. * This is a reminder that, in real-world terms, analysis of the Keystone XL issue that concludes that even without a pipeline the oil will all eventually be extracted and shipped is nonsense. Obviously companies who can’t ship their oil through pipelines are going to try to ship it out by rail instead. But it’s not a law of nature that they’ll be allowed to. 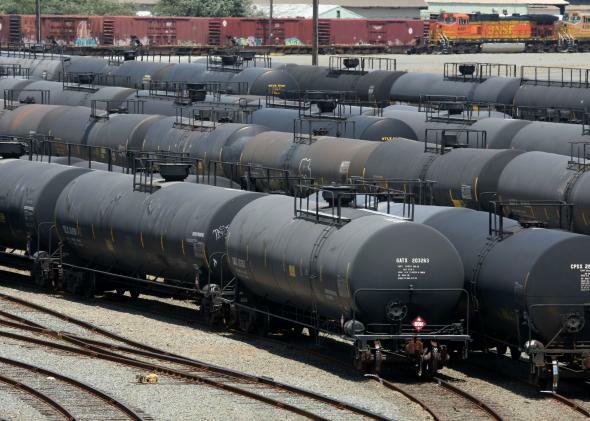 The growing volume of oil being shipped around on freight railroads is leading to a growing number of accidents and cries out for safety regulation. Like any industry facing pressure for safety regulation, the oil industry will argue that excessively strict regulation will be bad for business. But insofar as there’s a case to be made that the oil drilling industry isn’t actually one we should want to encourage, that argues for very rigorous oversight of everything related to safety, impact on surrounding communities, etc. Which is just to say that the same political struggle that you see around the pipeline can easily be called into existence around freight rail. Now of course if you think fossil fuel extraction is an industry we should be encouraging, you won’t care—you’ll be for pipelines and for rail shipments. But if you don’t think we should encourage fossil fuel extraction, it’s wrong to say the pipeline battle is pointless because the oil will just go out on train instead. If the political process can halt pipelines, it can halt railroads too. *Correction, Feb. 13, 2014: Based on an earlier Reuters report, this post originally misstated that the rail shipment contained natural gas. The train was carrying oil and included one car transporting propane.